Last night, after I had my calories done for the day, I had pretzels and dip. Boo! But, I still counted them out and measured them. And today, I am a little over. But, still tracking every thing. It’s the weekend, and I always do worse on the weekend. Hopefully, tomorrow I am able to stay in my calorie count. I have walked both days (and even Friday). I didn’t walk that long or that fast, but I walked. I could tell today was even easier than yesterday. Although, my legs are killing me for another reason. 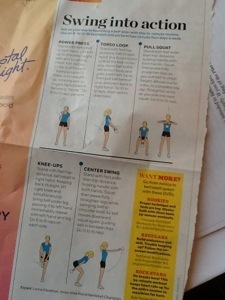 I cut it out of Weight Watchers magazine. It doesn’t look like much, but when you are completely out of shape, it makes it so that your legs hurt like nobody’s business. My inner thighs are soooo sore. Squats are difficult for me. But, it is a good hurt. I feel like I am heading somewhere. 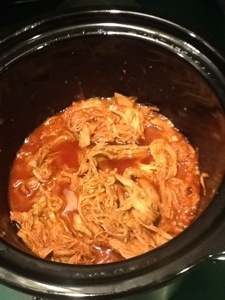 Tonight for dinner I made pulled pork in the crock pot. It was a new recipe, and it was good, but not great. 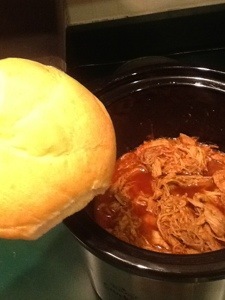 The meat was delicious, and tender, which helped. I served it on a kaiser roll, with cole slaw from the local fried chicken joint. I also served creamed corn from a can, which is one of my favorite foods ever, and I haven’t had it in a while because my husband doesn’t like it. 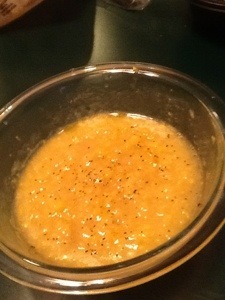 I make it then add a bit of butter, sugar, salt, and pepper. Mmmmm. And also, we had Bob Evan’s mashed potatoes. I am so full right now. Well, I am off to do a little grading. I’ve managed to procrastinate, and put it off until right now. 7:00 Sunday night. Oops. This entry was posted in Compulsive Eater and tagged calories, cole slaw, creamed corn, exercise, journey, mashed potatoes, pulled pork, walking, weight watchers magazine. Bookmark the permalink.